This breed tends to be unconcerned with strangers. It is very devoted to its family and is a great as a pet. Although the breed is gentle when playing with children, it may not be the best choice for a child to have, as it is not constantly playful which the child may find unsatisfactory. This breed tends to be “diva-like” as it does not like a lot of rough housing. Many Salukis can even be considered shy. It is quiet when indoors, and often looks for a warm, soft place to lay down. When outdoors, it will constantly chase smaller animals or anything that is fast-moving. It is not the best listener, as it doesn’t always come when it is called. Exercise for this breed is certainly required, but the best type of exercise suggested for this breed is for it to run around free in a closed in area. Its physical needs can also be met by long walks or by jogging. Hikes are also recommended, however, because of this breed’s desire to chase small animals, you may want to ensure that your dog is on a leash if you go for a hike. This dog is best suited to be an indoor dog. The breed is naturally thin, and are also known to be picky eaters. Many people look at this breed and think that it is undernourished, when in reality, it is not. There is no need to feed your dog extra just because you think it looks skinny. It is most likely nourished adequately. When it comes to health, the Saluki canines are a fairly healthy bunch of creatures. A major concern in the breed to keep an eye out for is hemangiosarcoma. A minor concern is cardiomyopathy. Hypothyroidism is also occasionally seen in this breed. When it comes to health, the Saluki canines are a fairly healthy bunch of creatures. A major concern in the breed to keep an eye out for is hemangiosarcoma. A minor concern is cardiomyopathy. Hypothyroidism is also occasionally seen in this breed.Of all the domestic dogs today, the Saluki is considered the most ancient breed. Evidence of this breed can be dated all the way back to several thousand years B.C. There is evidence of this breed inscribed on the Egyptian tombs. 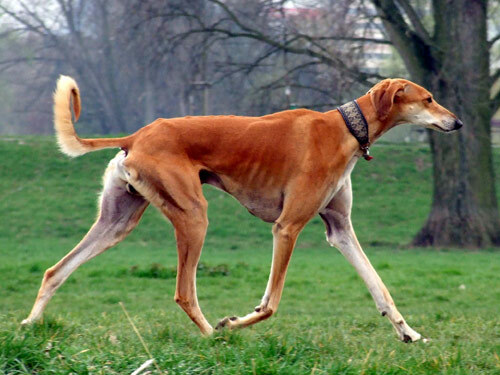 The name “Saluki” comes from the civilization Seleucia, which also dates back to ancient times. This breed was used to run down gazelles, foxes, and rabbits and they were typically helped by falcons. People of the Muslim religions considered dogs in general to be unclean, creatures, they made an exception for the Saluki, as it was considered very noble. It provided meat, which earned it a place to sleep in the tents along with attention from their masters. They were never allowed to breed with any other breed other than Salukis. This helped maintain their purity for hundreds of years. The breed became distributed due to their nomadic owners throughout the Middle East. It was not until around 1900 when this breed was officially introduced to the Western World. It was recognized by the AKC in 1928. Their numbers have drastically decreased since guns were invented, as the dogs were no longer in such high demand. The breed is also called the Persian Greyhound, Gazelle Hound, or the Tazi.